Gattaeno Savatteri’s La Conjuration des loquaces (La Congiura dei loquaci, 2000, just begging for an English translation) is the Sicilian novel for which I’d been waiting: in the most literal way, because it took me two years to obtain a copy in French after reader JLS’ enthusiastic recommendation, and in that the novel concerns itself with a topic I’d hoped to find in a Sicilian work and which touches on some family history. That subject is the immediate aftermath of the Allied liberation of Sicily in July, 1943 and the consequent strengthening of the Sicilian Mafia. The family history is simply that my father took part in this landing. Like many veterans, he seldom discussed the war, but he often fondly recounted his first meal on Italian soil: a plate of spaghetti at an outdoor terrace where he’d paid a young Sicilian boy to fan his plate with a palm frond to keep the flies at bay. Far more than a palm frond would be required to address the many scourges of Sicily, and the American record here in the years during and after the war was decidedly mixed. The Allied forces indeed succeeded in driving out the Nazis. The Americans also helped to conquer Sicily’s centuries-old problem of rampant malaria, albeit by introducing vast amounts of DDT into the island’s ecosystem. But the darkest consequence of the occupation was the Americans’ embrace of some of the most notorious figures in Sicilian society, permitting the Mafia to flourish - a price for liberation that Sicilians have been dearly paying ever since. Savatteri - novelist, journalist and specialist on the “Cosa Nostra” - bases his novel on an actual 1944 murder case related by his fellow Sicilian writer Leonardo Sciascia, from whom Savatteri has taken the book’s opening epigraph and for whom the novel clearly serves as homage. In Savatteri’s version of the story, one Vincenzo Picipò, the young father of an ill child, having already had minor run-ins with the law, is fingered for the murder of his town’s mayor, whose body has been left in a pool of blood in the town square. Meanwhile, a young American soldier of Sicilian descent has arrived in the town on orders to investigate a theft of military trucks from the area, only to find that the mayor he was to interview has been assassinated the previous night. With a name alluding to John Hersey’s A Bell for Adano, a novel set in the same period and vicinity and also concerning an American soldier driven to want to help out the locals, Lieutenant Benjamin Adano is drawn into the events and into the labyrinth of Sicilian morality and justice. He steered towards a wooden armoire, opened it and pulled out files…He continued to extract stacks of files from the armoire, throwing them on the desk. Accompanying Adano on his investigations is Semino, a Sicilian assigned to him who simultaneously presents a fawning obsequiousness and a scarcely veiled contempt for the American’s naivety. As they pursue the theft of the trucks, some of which they see being driven about in plain sight, they stumble one night upon the distraught wife and children of the arrested Picipò, and Adano is drawn into the family’s plight. Those with whom he speaks about the matter seem unconcerned. Witnesses have come forward to contradict Picipò’s alibi that he was home tending to his ill son. Others have sworn to having seen him out in the streets near the time of the killing. The accusation seems credible except that the protests of Picipò’s innocence from his family and, in scenes in which is interrogated, don’t add up to his being anything more than a petty thief and fall guy. Savetteri’s omniscient narrator permits the reader to witness not only Adano’s explorations and Picipò’s incarceration, but also those malignant operations working to prop up Picipò as a scapegoat. Threats, bribes and blackmail all come into play as those with an interest in covering for the culpable scheme together to muddy the paths that might lead to the truth. Savetteri also cleverly divides his novel into alternating sections entitled “Day” and “Night” to underscore the oppositional struggle between those seeking the truth and the forces determined to bury it. This is not a portrait of Sicily in which the light of day is likely to prevail. As in the mysteries of Sciascia and Camilleri, a kind of moral comprehension, rather than justice, may be the best one can hope to attain in a place so convulsed by corruption and violence. Determined to help the Picipò family, Adano visits them and, in a scene both tender and wrenching, makes a promise to help, even passing along to the eldest son his own father’s tattered copy of Dante’s Divine Comedy. The forceful epilogue to Savatteri’s tale demonstrates just how far such good intentions, however sincere, may carry. I’ve left the title of Savatteri’s novel untranslated here. “Conjuration” in English primarily suggests the invocation of the supernatural by means of magic, a definition certainly in use here; in the pool hall. the lines Adano overhears from Shakespeare come from the witches’ scene in Macbeth. Savatteri also milks the word’s Latin nuances, its origins suggestive of plots and conspiracies. In addition, “conjuration” as a literary term refers to the convergence of actions leading to difficulties or even the destruction of a character, a meaning all too apt for this story of the unfortunate Picipò. 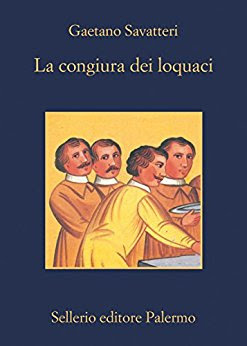 As for “des loquaces,” the direct English translation “of the loquacious” might better be captured by “of the big talkers,” “loudmouths” or “blabbermouths.” It need hardly be articulated what happens to blabbermouths involved with the Mafia. Like Curzio Malaparte’s The Skin, La Conjuration des loquaces acknowledges the American desire to help while unmasking American naivety. But the central focus of Savetteri’s story is Sicily itself and the extrajudicial and ingrown, tribal factors that make mockery of justice. No other work of fiction I’ve read concerning organized crime in Italy has revealed so penetratingly and movingly the sense of despair and futility in the face of such entrenched violence and impunity. Shakespeare and Dante, the literary giants who flank La Conjuration des loquaces, may well divide the world - but in the Sicily of Savetteri’s powerful, affecting and beautifully executed novel, what may most come to mind in relation to these writers is, in the case of the first, the weight of tragedy, and in the case of the second, the poet's descent into hell.